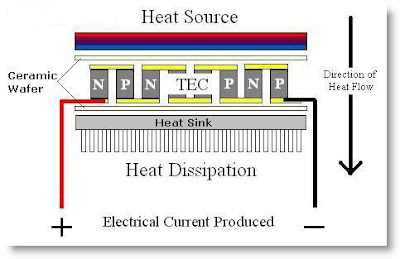 A thermoelectric generator (TEG) is a device that converts heat (temperature differences) into electricity, using a phenomenon called the "Seebeck effect" (or "thermoelectric effect"). TEG also called thermogenerators. Their typical efficiencies are around 5-10%. Having the ability to convert heat into usable electrical energy opens the door to many untapped energy sources and in a time when energy conservation, environmental issues and economic survival have become paramount concerns for all of us; expanding your energy options with the use of TEGs just makes good sense. TEGs are made from thermoelectric modules which are solid-state integrated circuits that employ three established thermoelectric effects known as the Peltier, Seebeck and Thomson effects. It is the Seebeck effect that is responsible for electrical power generation. Their construction consists of pairs of p-type and n-type semiconductor materials forming a thermocouple. These thermocouples are then connected electrically forming an array of multiple thermocouples (thermopile). They are then sandwiched between two thin ceramic wafers. These thermocouples are then connected electrically in series and/or parallel forming an array of multiple thermocouples (thermopile). When heat and cold are applied this device then generates electricity. Almost any heat source can be used to generate electricity, such as solar heat, ocean heat, geothermal heat, even body heat! In addition the efficiency of any device or machine that generates heat as a by-product can be drastically improved by recovering the energy lost as heat. Thermoelectric generators can be applied in a variety of situations. Usually, thermoelectric generators are used for small applications where heat engines (which are bulkier but more efficient) such as Stirling engines would not be possible. The use of waste heat in combustion engines promises to be a high volume application field. Not only the exhaust but also cooling agents are targeted. Two general problems exist in such devices: high output resistance and adverse thermal characteristics. In order to get a significant output voltage a very high Seebeck coefficient is needed (high V/°C). A common approach is to place many thermo-elements in series, causing the effective output resistance of a generator to be very high (>10kOhm). Thus power is only efficiently transferred to loads with high resistance; power is lost across the output resistance otherwise. A generator with very high output impedance is effectively a temperature sensor, not a generator. Secondly, because low thermal conductivity is required for a good TEG, this can severely dampen the heat dissipation of such a device (i.e. TEG's serve as poor heat sinks). For example it is not generally considered wise to place a TEG on an essential IC chip that requires cooling. Because of the low thermal conductivity of a TEG device, that IC is cooled at a slower rate. Space probes to the outer solar system make use of the effect in radioisotope thermoelectric generators for electrical power. Thermoelectric generators have been in use for many years by NASA to power spacecraft and the oil and gas industry to power remote monitoring stations around the globe. Only in recent years has this technology become available to the general public. Solar cells use only the high frequency part of the radiation, while the low frequency heat energy is wasted. Several patents about the use of thermoelectric devices in tandem with solar cells have been filed. The idea is to increase the efficiency of the combined solar/thermoelectric system to convert the solar radiation into useful electricity. The need for thermoelectric power . . .
Electricity is no longer a luxury, it has become a necessity in our everyday lives. Have you ever had to live without electricity for an extended period of time? If so then you know what it is like to loose all the food in your refrigerator and/or chest freezer and shivering in the cold because you have no heat. Every year thousands, even millions have been in this position when a winter storm knocked out power over large areas. Not to mention rapidly rising energy costs and an uncertain economic future. Still many people have become complacent about their electrical energy needs. Solar panels are a great alternative energy source, but they only produce electricity during daylight hours. In addition their daily output is significantly reduced during winter months and cloudy days. Now, using a TEG in conjunction with solar and wind, their combined output can provide all off your home’s energy needs and depending on what state you live in, you will be getting a check from the electric company instead off a bill!